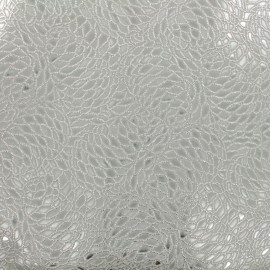 Amazing Cobra fake leather, ideal for making bags, clutches, accessories or interior piece of decoration ... With its original snake patterns in light relief with an original silver color, it should inspire you and bring an original touch to your creations ! 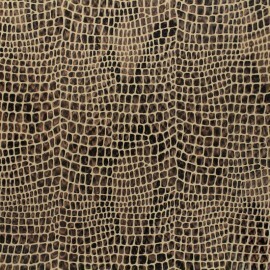 Amazing Caiman fake leather, ideal for making bags, clutches, accessories or interior piece of decoration ... With its original crocodile patterns in light relief with a coffee brown color, it should inspire you and bring an original touch to your creations ! 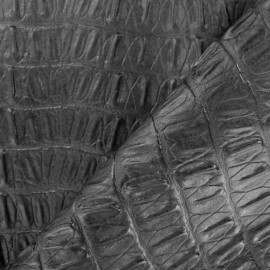 Amazing Caiman fake leather, ideal for making bags, clutches, accessories or interior piece of decoration ... With its original crocodile patterns in light relief with a green dark grey color , it should inspire you and bring an original touch to your creations ! 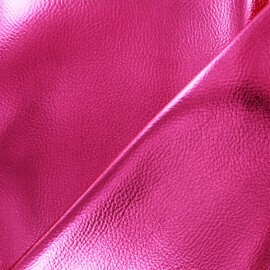 Amazing Metallic fake leather, ideal for making bags, clutches, accessories or interior piece of decoration ... With its original Magenta Pink metallic color, it should inspire you and bring an original touch to your creations ! 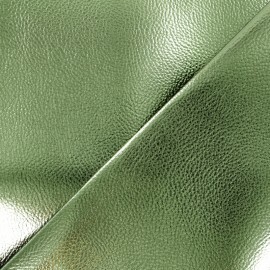 Amazing Metallic fake leather, ideal for making bags, clutches, accessories or interior piece of decoration ... With its original olive green metallic color, it should inspire you and bring an original touch to your creations ! Discover this beautiful Ceylan Leopard imitation leather fabric with the fur pattern of the most beautiful leopards of Sri Lanka, brown color version! 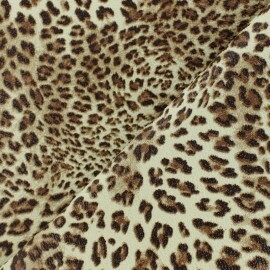 Be matched with the new 2019 trend with this leopard print, it will be ideal to bring a wild spirit to your creations! 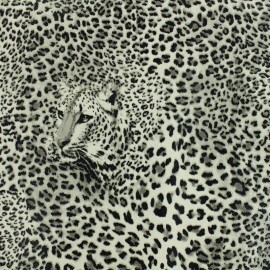 Discover this beautiful Ceylan Leopard imitation leather fabric with the fur pattern of the most beautiful leopards of Sri Lanka, black and white version! 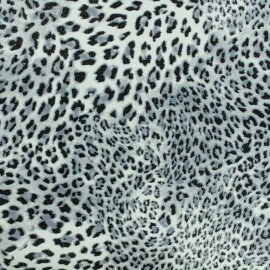 Be matched with the new 2019 trend with this leopard print, it will be ideal to bring a wild spirit to your creations! 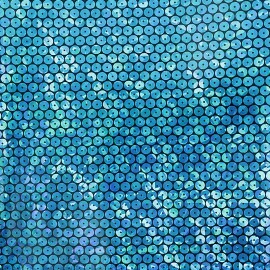 Amazing Party fake leather, ideal for making bags, clutches, accessories or interior piece of decoration ... With its turquoise blue holographic sequin patterns, it should inspire you and bring an original touch to your creations ! 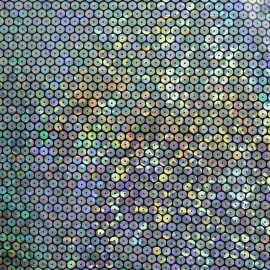 Amazing Party fake leather, ideal for making bags, clutches, accessories or interior piece of decoration ... With its silver holographic sequin patterns, it should inspire you and bring an original touch to your creations ! 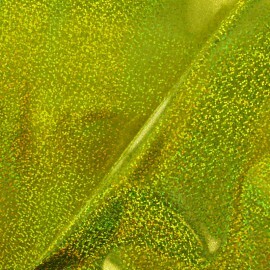 Amazing Shine fake leather, ideal for making bags, clutches, accessories or interior piece of decoration ... With its metallic gold holographic patterns, it should inspire you and bring an original touch to your creations ! 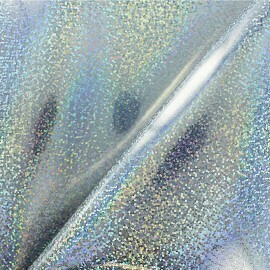 Amazing Shine fake leather, ideal for making bags, clutches, accessories or interior piece of decoration ... With its metallic silver holographic patterns, it should inspire you and bring an original touch to your creations ! 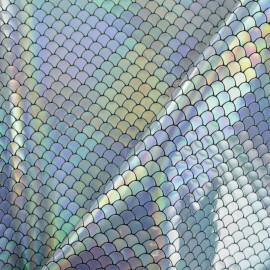 Amazing Ariel fake leather, ideal for making bags, clutches, accessories or interior piece of decoration ... With its metallic silver mermaid scale patterns, it should inspire you and bring an original touch to your creations and be a Mermaid princess ! 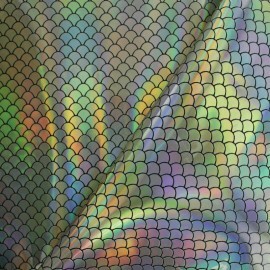 Amazing Ariel fake leather, ideal for making bags, clutches, accessories or interior piece of decoration ... With its metallic gold mermaid scale patterns, it should inspire you and bring an original touch to your creations and be a Mermaid princess ! 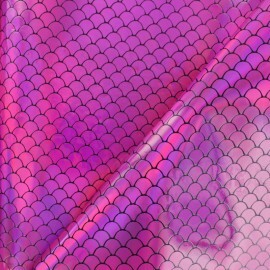 Amazing Ariel fake leather, ideal for making bags, clutches, accessories or interior piece of decoration ... With its metallic pink mermaid scale patterns, it should inspire you and bring an original touch to your creations and be a Mermaid princess ! 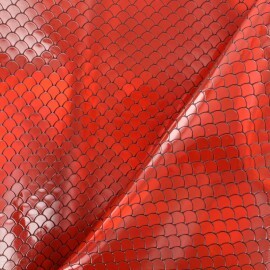 Amazing Ariel fake leather, ideal for making bags, clutches, accessories or interior piece of decoration ... With its metallic red mermaid scale patterns, it should inspire you and bring an original touch to your creations and be a Mermaid princess ! 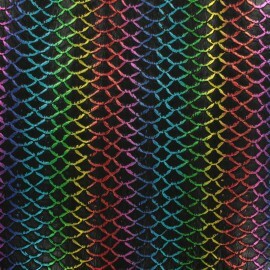 Amazing "Dancing Queen" fake leather, ideal for making bags, clutches, accessories or interior piece of decoration ... With its Rainbow psychedelic side and its holographic patterns, it should inspire you and bring an original touch to your creations! 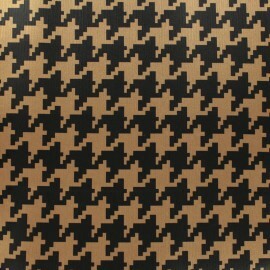 Enjoy our faux leather upholstery fabric! Discover our Troquet faux leather fabric in silver color with a white felt side. 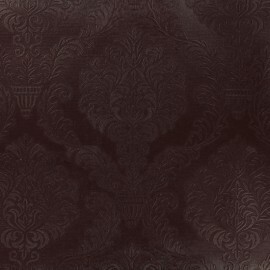 Enjoy our faux leather upholstery fabric! Discover our Troquet faux leather fabric in blue color with a white felt side. 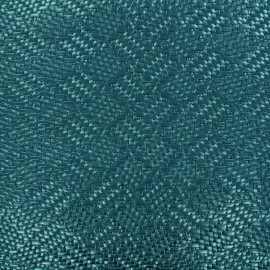 Enjoy our faux leather upholstery fabric! 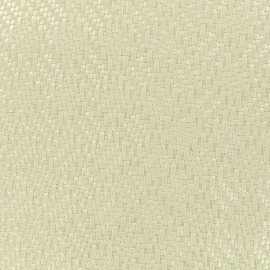 Discover our Troquet faux leather fabric in gold color with a white felt side. 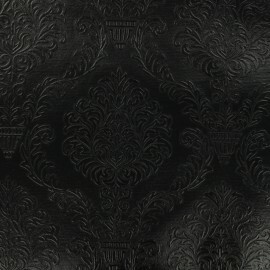 Enjoy our faux leather upholstery fabric! 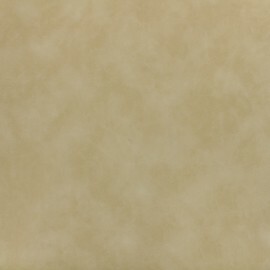 Discover our Silver faux leather fabric in gold color with a white felt side. 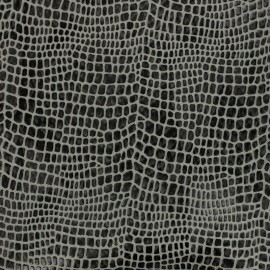 Silver imitation leather, wonderful damask pattern "tone on ton"
Burgundy imitation leather, wonderful damask pattern "tone on ton"
Black imitation leather, wonderful damask pattern "tone on ton"
Sepia cotton imitation leather, ideal to play to Dundee's crocodile! 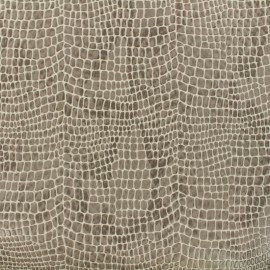 Beige cotton imitation leather, ideal to play to Dundee's crocodile! 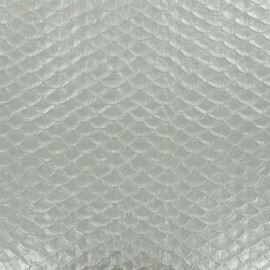 White cotton leather imitation (crocodile touch) so freezee! 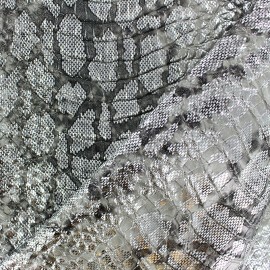 Silver cotton leather imitation black white (crocodile touch) so shining! Reupholster you furnitures with our furnishing fabrics selection! 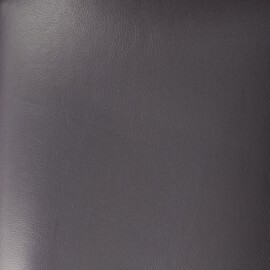 Discover this beautiful thick faux leather, ideal to cover seats or to create cushions, bags, accessories... Plus, our leatherette fabric can be used as vegan leather. This intense green color will be a pleasure to associate. Reupholster you furnitures with our furnishing fabrics selection! Discover this beautiful thick faux leather, ideal to cover seats or to create cushions, bags, accessories... Plus, our leatherette fabric can be used as vegan leather. This intense purple color will be a pleasure to associate. Reupholster you furnitures with our furnishing fabrics selection! Discover this beautiful thick faux leather, ideal to cover seats or to create cushions, bags, accessories... Plus, our leatherette fabric can be used as vegan leather. 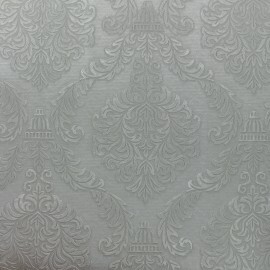 This classical white color will be simple to associate. Reupholster you furnitures with our furnishing fabrics selection! Discover this beautiful thick faux leather, ideal to cover seats or to create cushions, bags, accessories... Plus, our leatherette fabric can be used as vegan leather. This ochre color is wonderful! Discover this fashion wonderful washable paper fabric for all of your creations. 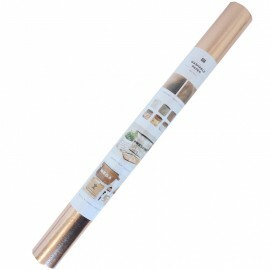 Also called Vegatex paper, you will enjoy our vegan leather paper in copper for all your diy projects! Discover this fashion wonderful washable paper fabric for all of your creations. 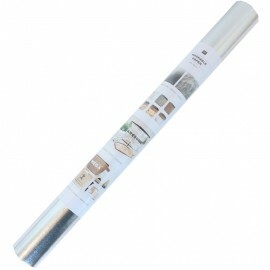 Also called Vegatex paper, you will enjoy our vegan leather paper in silver for all your diy projects! Discover this fashion wonderful washable paper fabric for all of your creations. Also called Vegatex paper, you will enjoy our vegan leather paper in gold for all your diy projects! Discover this fashion wonderful washable paper fabric for all of your creations. 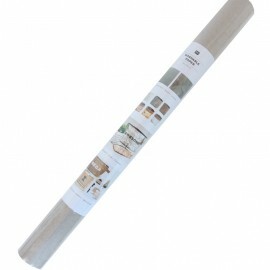 Also called Vegatex paper, you will enjoy our vegan leather paper in grey for all your diy projects! Find the best leatherette selection at your favourite fabric store ! Discover a wide collection of furnishing upholstery fabrics for upholstery and more! When it comes to sewing, you want to find luxurious resistant cloth, textiles and drapery fabric. Among our upholstery fabrics wholesale, choose the best upholstery fabric! 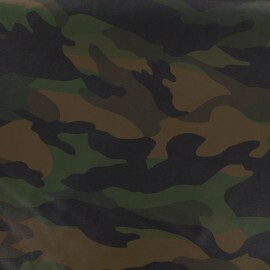 Soft, supple and high quality, our leatherette fabric is as good as a quality leather. 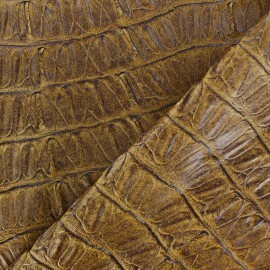 Great alternative to leather furniture, our fake leather is the best home decor fabric. 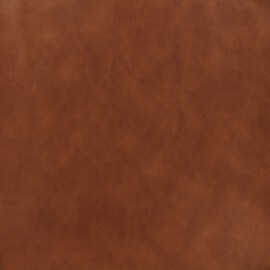 Our PVC leather and synthetic leather has the look and feel of leather upholstery fabric. Perfect for creating decor pieces and garment, it is easy to sew without sewing notion. 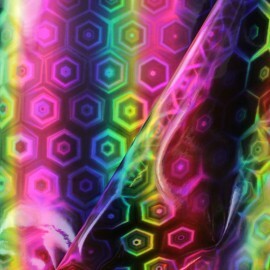 Do you need thick fabric and crazy designs? 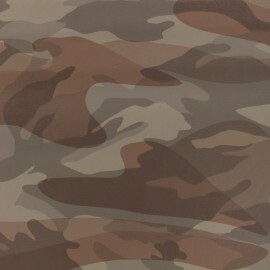 Do you enjoy durable fabrics? Ma Petite Mercerie will become your favourite fabric upholstery supplier! 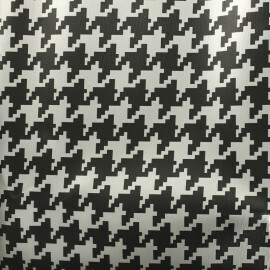 We offer a large number of faux leather fabric with floral details, chevron, gingham, stripes, and so forth. Find the leatherette you need, among our color palette from beige, burgundy, and charcoal, to turquoise and taupe. Want to try but not sure what colour? Order fabric remnants prior to ordering the needed amount. 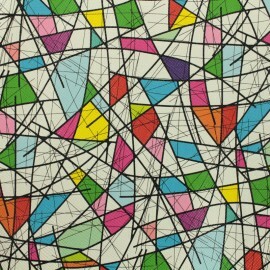 Once you received your swatch, purchase leatherette fabric by the yard or by the metre. 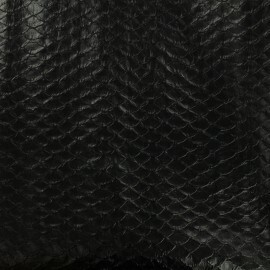 Then, mix leatherette with jacquard fabric ! Either you want to sew a purse, or create a sofa, you will need the best webbing, microfiber foam and upholstery material, cord and scissors. Choose among our upholstery fabric by the yard and mix and match our leatherette with other furniture upholstery material: cotton fabric, twill fabric, minky, flannel, fleece canvas fabric, organza, jute, microsuede, washable vinyl material, and more. Create a unique pair of curtains and blinds, in leatherette, thanks to our upholstery supplies. Use your leatherette fabric remnant to stitch tiebacks.